There is no such thing as the perfect swing! Except if we mean a swing that YOU can repoduce consistently and play the game to your capabilities. Yet virtually ALL golf instruction is centered around developing that ever elusive perfect swing. Tell me if this sounds familiar...hold the grip like this, not too firm, just enough to know you're holding on comfortably. Ok, stand tall and don't squat too much. Keep that spine angle. Keep yourt weight inside the balls of your feet as you swing. Stay in balance. Get behind the ball and make sure you transfer your weight through the downsing...don't forget to extend to the target on your follow through and stay connected while you swing....and on and on it goes! Phew. I'm exhausted just typing it and reading it! Yet this how most people go about learning golf. NONSENSE. Everyone has a natural swing within them waiting to be discovered. One that fits you. Not you fitting the swing. Does this make sense? I'm in the process of developing our golf training schools (mixing the mental game and world class instruction) with a Top 100 PGA instructor and he talks bout emptying tired ole' concepts from your swing. To get to "flow", as he puts it, is critical even in the earliest stages of learning the game. So how do we achieve this "flow" state AND develop our swing without cluttering our left brain/consciouis mind. Here's the secret: you want to completely shift your perspective of the game. By focusing on playing golf NOT "thinking golf swing." Do you get the difference? It's as wide as the grand canyon in how your performance AND your swing will improve. Virtually every golfer I play with and know, when on the golf course, are thinking about their swing as they play. When I play I can tell you not once do I think about my grip or a host of other swing thoughts. Your mind should be on playing the game, choosing a specific target on every shot, and getting the ball in the hole! Perfect swings don't equal perfect performance. Tom Watson literally couldn't hit a fairway for his first 2 years on tour yet he did ok didn't he? His swing was definitely not perfect. Neither was Seve Ballesteros. He was all over the lot as well. Yet they had something in common that many modern players have lost. The perspective that it's a game of moving the ball toward the target, the hole. How that happens...who cares! I want you to do a few things that will directly change your game forever. I'm not overstating this. I want you to focus on a target on every shot the next time you play. 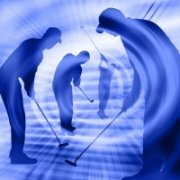 Continue to place your attention on playing golf not thinking golf swing when on the course. From the mouth of a top 100 PGA tour teacher, "Hit the ball and let it go wherever it wants. Find it, then hit again!" I'm as serious as a heart attack on this issue. If you truly want to find that "flow" within you you MUST get out of your own way. And this means out of your left brain/conscious analysis of things. This is achieved by directing your attention outward, not inward. Get it? Those of you who catch the importance of these critical distinctions, and take the time to make this fundamental change, will experience a brand new way to experience the game. Your consistency in playing well will skyrocket. Your joy will explode. The modern golf instruction industry has players hyper aware of too many aspects of their swing at the expense of what really matters. Playing the game! Develop your swing and keep your mind on the fact that it's a game and when you're on the course it's time to play.